Taking a little break from virtual populations I thought it would be interesting to continue the spirit of this project and try out another new technology I've not dirtied my hands with before. Physics (or more specifically mechanics) has been a staple of game development for about ten years now since ground breaking releases such as Half Life 2 and it's popular community modification Garry's Mod in 2004 but even though such technology has appeared in countless products in the last decade I've never actually had to implement it myself so I thought it was about time. Writing a performant and stable physics system from scratch is a complex and exacting process but fortunately there are a variety of freely available physics solutions that can be leveraged on the PC, one of the most well known of which is the Bullet physics library so that's where I started. My end goal for the initial physics integration was to create a vehicle of some sort that could be driven around on my virtual planet so features pertaining to that objective were the priority. After a little research however I found that the vehicle simulation features of Bullet were quite limited so I looked around for an alternative. On second look I found that the Nvidia PhysX SDK offered a more complete vehicle simulation model so I refocussed my efforts on that. Although physics can be complex, fortunately PhysX comes with a useful set of samples that were a great aid getting started. Thanks to these it wasn't too difficult to get the SDK linking in and the basic simulation objects for a vehicle up and running. 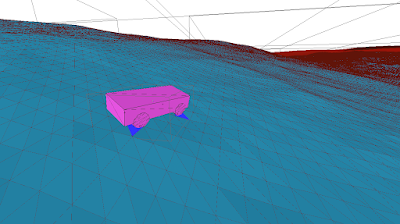 I then hit a wall however as originally I had hoped I could provide some sort of callback to perform the required ray tests for the vehicle against the terrain heightfield but as far as I can tell PhysX simply does not offer this functionality. What it does provide is a heightfield shape primitive that would normally be a logical fit for vehicle simulation but as these are square and essentially flat while my plant is neither having to make use of them made implementing my vehicle more of a challenge than I had originally intended. In addition to the problem of mapping square physics heightfield grids to my spherical planet the other major problem is the same one facing virtually every other system involved in planet scale production - namely that of floating point precision. For speed PhysX in line with most real time physics simulation systems operates on single precision floating point numbers by default, but these of course rapidly lose precision when faced with global distances. PhysX can be recompiled to use double precision floating point which would probably sort out the issue but the performance would suffer with such numerically intensive algorithms and as I would like to leave the door open for making more extensive use of physics in the future I didn't really want to go down that route. The alternative is to establish a local origin for the physics simulation that is close enough to the viewpoint that objects moving and colliding under physics control do so smoothly and precisely even when single precision floating point is used. The key here is that all numbers in the physics simulation are relative to this origin so they never get too big, although for this to work of course the origin itself needs to be updated to stay close enough to the viewpoint as it moves around the planet's surface. As mentioned before my planet is constructed from a subdivided Icosahedron so has as it's basis 20 large triangular patches each of which is subdivided eight times to give 65,536 triangles. As the viewpoint moves closer to the surface these root patches are in turn progressively subdivided each root patch turning into four new patches each made up of the same number of triangles but covering one quarter of the surface area thus increasing the visual fidelity. My planet is represented by two radii, the Inner Radius which defines how far the lowest possible point on the terrain (the deepest underwater trench say) is from the centre of the planet and the Outer Radius which defines how far the highest possible point is from the centre of the planet (the top of the highest mountain say). Between these two distances lies the planet's crust that is being represented by the terrain geometry. To produce an approximation of an Earth sized planet I am currently using an inner radius of 6360 Km and an outer radius of 6371 Km giving a possible crust range of 11 Km or about 36,090 feet - significantly less than the corresponding distance on Earth were you to measure from the bottom of the Challenger Deep to the top of Mount Everest but I don't have much interest in simulating deep sea environments at the moment so I'm focussing on the more humanly explorable (and visible) portions of our planet for now. 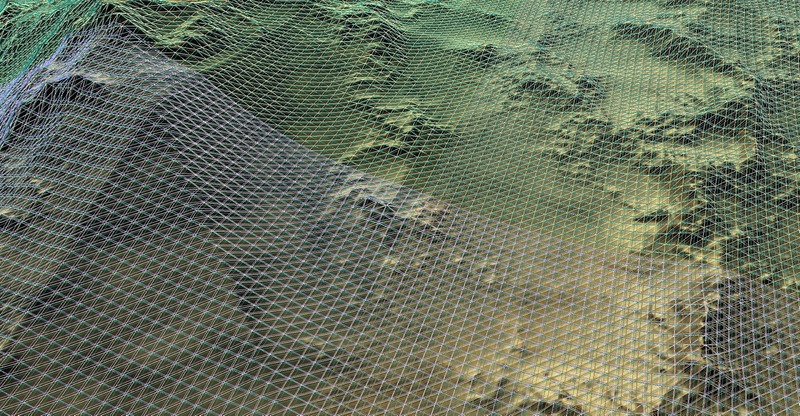 The table below shows the relative size of terrain patches and the renderable triangles they contain at each level of subdivision. As the level increases you can see the number of patches and triangles needed to represent the entire planet grows exponentially, terminating at patch level 18 which would require 90 quadrillion triangles to be rendered! 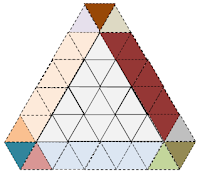 This Icosahedron topology provides a useful basis for physics origin placement as it naturally divides the planet's surface into discrete units, the decision of which subdivision level to use is all that is necessary. The trade-off here is that using deeper subdivision levels produces more accuracy as it restricts the distance any physics object can be from the origin but necessitates moving the origin more frequently because of this limited range. It also has to be borne in mind that generating heightfield data for the physics system is not instant so the maximum travel speed of any vehicle required to drive upon the ground needs to be restricted such that nearby data can be generated fast enough to be ready by the time the vehicle gets there. In practice I don't think this should be a problem for any real world style vehicle, and fast moving vehicles such as planes can use a different less detailed system. For now I've chosen to use patch subdivision level 13 as the basis for my physics origin, the reason being that I wanted to obtain a physics heightfield resolution of approximately 1 metre per sample which a 1024x1024 heightfield shape provides for that level (the table shows the patch length of a level 13 patch (L13) is approximately 1 Km). When the physics system is initialised the origin is set to the centroid of the L13 patch under the viewpoint then as the viewpoint moves about and leaves that patch the origin is teleported to the centroid of the new L13 patch above which it now resides. Any active physics objects need to have the opposite translation applied to keep them constant in planet space despite the relocated origin. 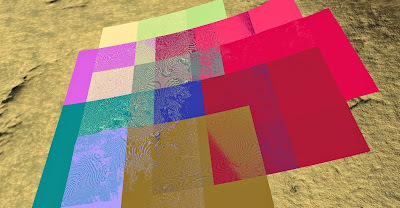 This means that in addition to producing a heightfield for the patch under the viewpoint twelve more need to be generated ready for when the viewpoint moves. Once this move to an adjacent patch does occur then any new patches not already generated from the twelve adjacent to the new central patch are generated and so on. 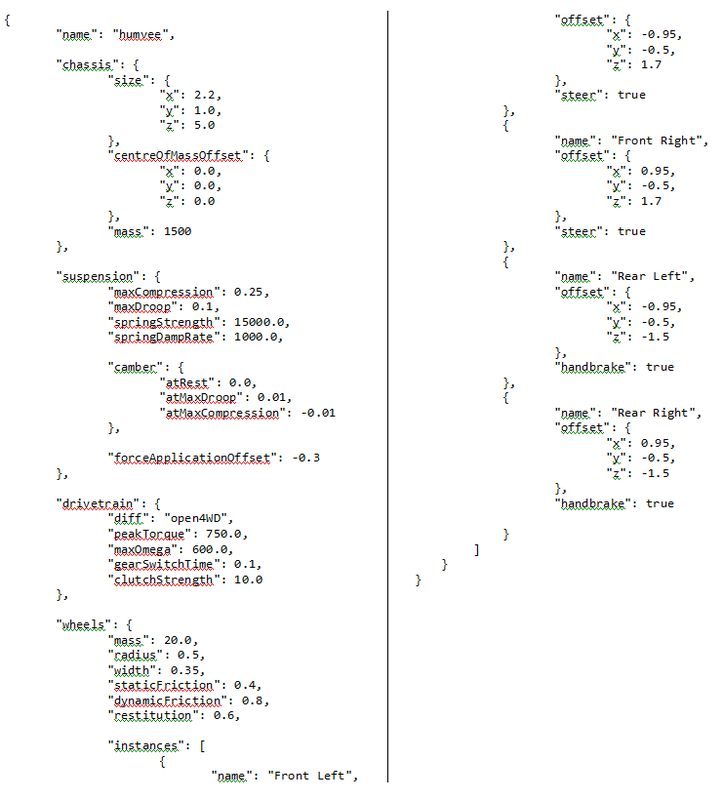 As all this data generation takes place on background threads the main rendering frame rate is unaffected. Having a 1024x1024 PhysX heightfield shape for each L13 patch is one thing, but the square essentially 2D heightfield has to be orientated properly to fit onto the spherical planet. This is done by establishing a local co-ordinate system for each L13 patch, the unit vector from the planet centre to the centroid of the patch is defined as the Y axis while the X and Z are produced by using the shortest 3D rotation that maps the planet's own Y axis to the local patch one. Although this does produce a varying local co-ordinate space across the surface of the planet it doesn't actually matter as long as the inverse transformation is used when populating the heightfield - this ensures the heightfields always match the global planet geometry. One final adjustment to make sure the entire planet can be traversed is to modify the direction of gravity with each origin relocation so it always points towards the centre of the planet. This overlap of physics geometry is both inefficient and prone to producing collision artifacts due to the inexact intersections of nearly coplanar geometry. 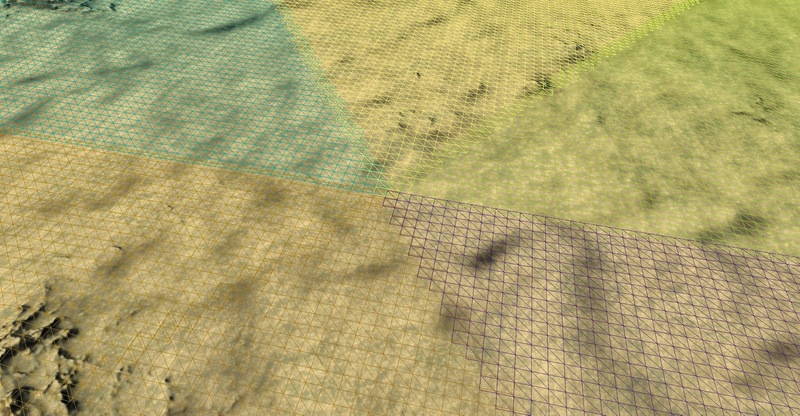 Fortunately PhysX has the ability to mark heightfield triangles as "holes" making them play no part in collisions. 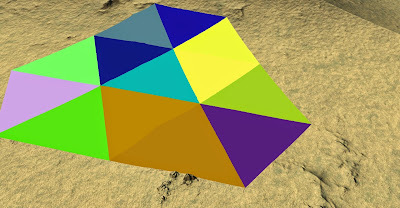 Marking any heightfield triangles that fall entirely outside of the owning L13 patch as holes produces a much better fit with minimal overlap between adjacent heightfields. 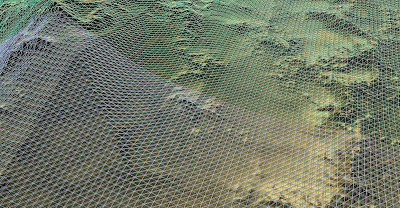 Distant view of the physics heightfields again but this time quads falling outside of the geometry patch are marked as holes and not rendered showing a much better fit to the underlying mesh topography. The final step to achieving my goal is the vehicle itself. I'm no artist and don't have a procedural system to create vehicles at the moment so I turned to the internet and found a free 3D model for a suitable vehicle that was licensed for personal use - a Humvee seemed appropriate considering that all driving is off-road at the moment in the absence of roads. 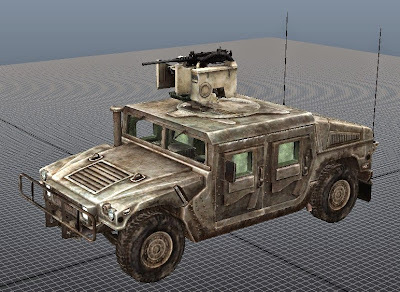 Downloaded Humvee model in Maya. At around 26K triangles it's about right for the balance of detail and real-time performance I want. This gave me something to render visually but of course the physics model has to be set up appropriately to match with the wheels the right size and in the right place, the suspension travel and resistance set to reasonable values along with the mass of all components and the various drive-train parameters set up to give a suitable driving experience for example. In total there are quite a few major parameters controlling the physics vehicle model with many more more advanced controls lurking in the background. The all important feel of driving the vehicle relies on the interplay of these many variables so it is important that they can be experimented with as easily as possible to allow tweaking. 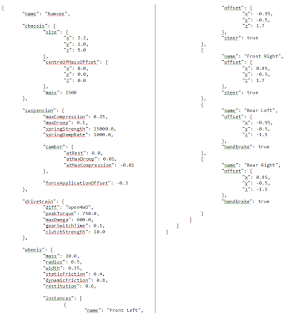 To this end I put the parameters into a JSON file which can be reloaded with the press of a key while driving around allowing engine power, chassis mass, suspension travel and the like to be altered and the change evaluated immediately for fine tuning. 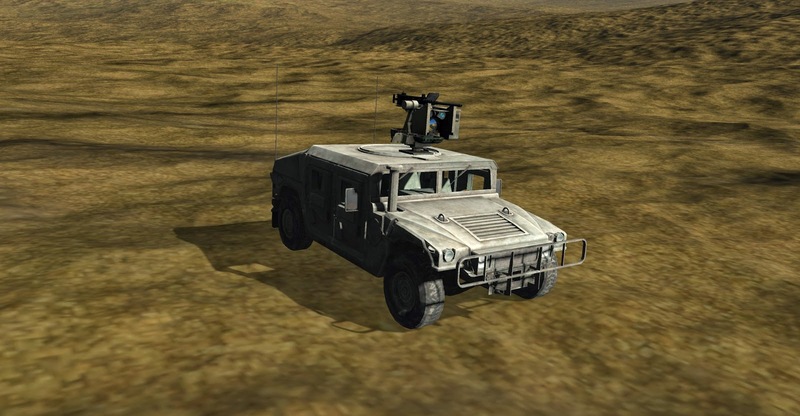 By making it data driven it also allows me to easily set up different vehicle models simulating everything from fast bouncy beach buggies to lumbering military vehicles or even civilian buses or lorries which sounds like a lot of fun. Fortunately when playing with all this PhysX includes a really handy visual debugger tool that lets you see exactly what the physics simulation thinks is going on - which can often be quite different to what is being rendered if you have bugs in the mix. With PhysX in and working, heightfield shapes set up to collide against and a vehicle to drive hooked up to basic keyboard inputs for steering, acceleration, brake and handbrake I had everything I needed but while fun to drive around I felt it looked somehow wrong...which after a little thought I realised was because the vehicle didn't have a shadow on the terrain. Without this it didn't really feel that it was sitting on the ground more floating some distance above it, and it certainly wasn't clear when it caught air leaping over bumps on the ground.